Charity Valentine is the eternal optimist. While working at the seedy Fan-Dango ballroom, she is often taken advantage of and continually experiences bad relationships. Finally, she seems to have met a decent fellow in Oscar. Trying to hide her true profession, she lies to him and tells her that she works in a bank. Soon, Oscar asks Charity to marry him. Unfortunately, Oscar discovers Charity’s real profession and backs out of the marriage. Nevertheless, Charity continues to remain hopeful that good things will happen in her life. HEY big spender… spend a little time with local amateur musical company Allegro this week, as they bring Bob Fosse’s award-winning Sweet Charity, to the Church Hill Theatre. Take a trip back to 1960s at the Morningside Road venue from tonight, for an evening of tie-die tops, kaftans, beehives and misadventures as gullible and guileless New York dance hall hostess Charity Hope Valentine dreams of finding the right man. Company president Joni Smith says, “All of Allegro is looking forward to bringing Sweet Charity to life. As a committee we picked this show because it is the perfect mix and genuinely has something for everyone. For the singers in the company there are the classic musical numbers Big Spender, Rhythm of Life and If My Friends Could See Me Now, while the hoofers have the inspiration of the legendary Fosse to spur them on. “Bob Fosse was an extremely talented choreographer and director and the entire cast has worked hard to ensure we do his legacy justice,” says Smith. Directed by Fraser Jamieson, the production team is completed by choreographer Caroline Howie and musical director Finlay Turnbull. Taking the title role is Emma Dawson, while Jonny Farley plays Oscar and Harry Dozier is Daddy. “We are itching to get on stage and can’t wait to bring the fun from rehearsals to an audience,” adds Smith. 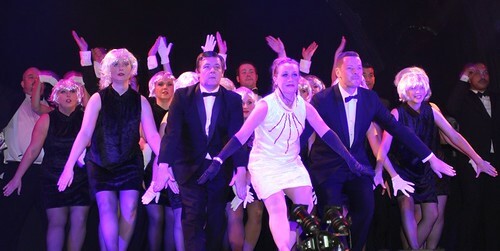 Consistent entertainment and a high level of skill mark out Allegro’s production of Sweet Charity at the Church Hill all this week, despite the occasional mis-step. The tale of Charity Hope Valentine, a nightclub hostess who remains optimistic despite a series of romantic misadventures, may have seemed black-hearted and somewhat shocking when it first appeared. However, to a more cynical modern audience, there needs to be enough energy and verve in the production to stop what is essentially a loosely connected series of vignettes from outstaying its welcome. While this production never threatens to drag, it does not quite possess the necessary pizzazz to put it in the highest category. Where it certainly does shine is in a huge and consistently strong cast. From the beginning, director Fraser Jamieson’s deployment of the 33-strong ensemble means that the stage is always a buzz of activity. There is always something to look at, everyone is given something to do and the energy levels are consistently high, while the cast’s role in moving the furniture and scenery means that the pace of the show never flags. There is a commendable ambition in the staging and Caroline Howie’s choreography. Indeed, it is this ambition which comes closest to threatening to derail proceedings. I’m A Brass Band, which is designed as a huge ensemble number near the end of the show, features a routine that is obviously just too difficult for some of the cast, and comes across as somewhat undercooked as a result. This does not, however, diminish the impact of the earlier ensemble routines, notably the set-piece dances of The Rich Man’s Frug, which are magnificently done. There is a consistently high level of acting and the accents are largely superb. The female members of the cast generally outshine the men vocally – Lauren McLachlan and Emma Collins, as Charity’s fellow taxi dancers Helene and Nickie, both possess an enviable combination of power and control, and they are able to convey the meaning of the lyrics excellently. Like many of the cast, their dancing appears accomplished rather than sparkling, but this does not detract from excellent overall performances. 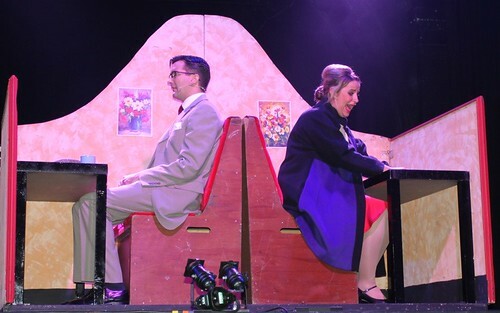 Ross Bain, as Italian movie star Vittorio, and Jonny Farley, as Charity’s nerdy fiancé Oscar Lindquist, both seem a little uneasy in their featured musical numbers, having to reach for notes a little too often. However, they both make up for this with winning stage presences; Farley in particular shows brilliant comic timing. There are no quibbles with the singing of Harry Dozier as the dubious ‘jazz priest’ Daddy Brubeck or James McCutcheon as nightclub owner Herman, who are both excellent. In particular, McCutcheon’s vocal on I Love To Cry At Weddings at the end of the performance has you wishing that the character had more to do earlier. Technically, the show is irreproachable. Technical Manager Paul Inglis presides over a hugely complicated operation, while the sound and lights – credited to MM Sound and Lighting – are of the highest class. Musical director Finlay Turnbull marshals the resources of a huge live band, whose stamina and gusto are never in doubt. The whole show, however, has to stand or fall on the character of Charity, who holds the whole thing together – and Emma Dawson is excellent throughout. She is an immensely sympathetic and charming Charity, whose singing is consistently superb, with excellent control, judiciously used power and real emotion without ever being overdone. She is also a notable comic actor. The scene where she and Oscar first meet and are trapped in an elevator is the highlight of the evening; it is difficult to imagine that it has ever been done better. The only criticism that could be levelled at Dawson is that her dancing is occasionally functional rather than inspiring. This sums up what this highly enjoyable production is missing; that little extra element of sparkle. Perhaps the most successful number is the evergreen Big Spender, where the choreography features striking tableaux and stylised movement which is more successful than some of the more conventional dance numbers. If, at times, there seems to be a slight lack of confidence from some of the cast, overall the huge ambitions of this entertaining production are realised.